It is rather frequent that after trauma some patients suffer from improperly healed fractures, pseudarthrosis (not healed fractures), osteomyelitis (bone infection), shortening or twisting of limbs, which leads to severe disability. The Ilizarov method is the ideal way to restore limb functionality disorders, unlike the classic orthopaedic surgery, which is usually powerless in such cases. A 28-year old patient from Libya referred for bone defect of the left lower tibia and for soft tissue defect of the same area. The patient suffers from osteomyelitis of the left distal tibia. Injury was inflicted from firearms during the war in Libya. Initially the patient was treated in his country by repeat debridement of the wound with the restoration of the bone defect with medical cement. I operated on this patient in co-operation with a plastic surgeon. Initially, a debridement of the affected area was performed with the removal of cement residues and tibial fragments. Then, the plastic surgeon reconstructed the missing skin area by using plastic vascularized local flap (propeller type). 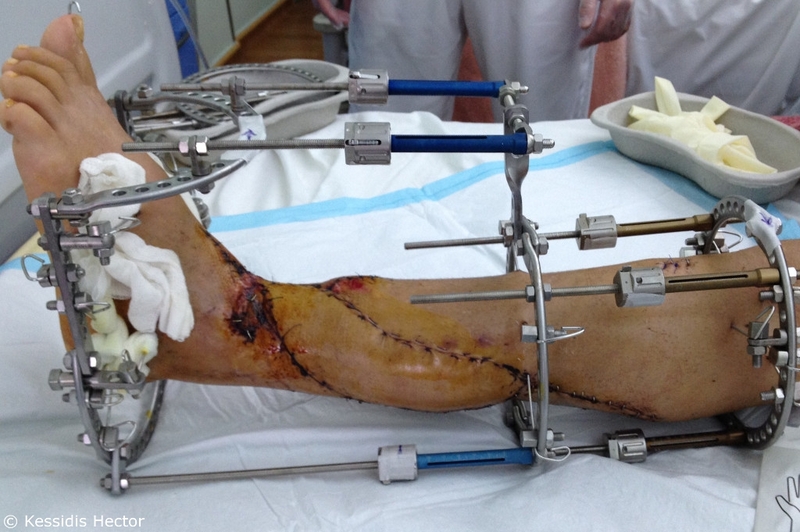 Then, external fixation (ostesynthesis) was performed using the Ilizarov Method, which was followed by tibial osteotomy (at the top) to lengthen and restore the defect of the left-sided tibial lower third during the postoperative period. Four months after the first operation, the arthrodesis (healing) of the ankle joint was completed. The total duration of the treatment was ten months.